WASHINGTON, D.C. -- The U.S. Payroll to Population employment rate (P2P), as measured by Gallup, fell to 42.9% in December, from 43.7% in November. 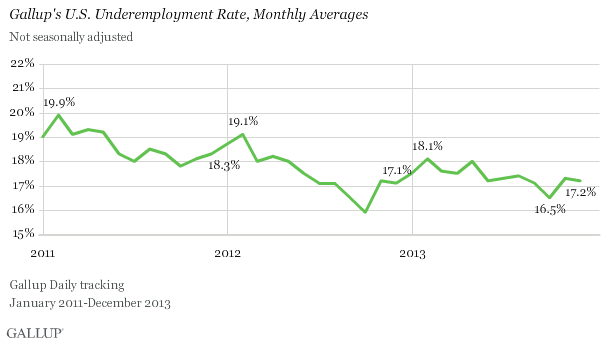 The current rate is the lowest Gallup has measured since March 2011. Gallup's P2P metric estimates the percentage of the U.S. adult population aged 18 and older that is employed full time by an employer for at least 30 hours per week. P2P is not seasonally adjusted. However, because of seasonal fluctuations, year-over-year comparisons are often helpful in evaluating whether monthly changes are attributable to seasonal hiring patterns or true growth (or deterioration) in the percentage of people working full time for an employer. The P2P rate for December 2013 is down from 44.4% in December 2012 and 43.8% in December 2011, but is higher than the 42.4% of December 2010. The most recent results are based on Gallup Daily tracking interviews with approximately 26,000 Americans, conducted Dec. 1-29 by landline and cellphone. Gallup does not count adults who are self-employed, working part time, unemployed, or out of the workforce as payroll-employed in the P2P metric. Unlike Gallup's P2P rate, which is a percentage of the total U.S. population, traditional employment metrics, such as the unemployment rates Gallup and the U.S. Bureau of Labor Statistics (BLS) report, are a percentage of the workforce. Gallup defines the "workforce" as adults who are working or actively looking for work and available for employment. The U.S. workforce participation rate in December was 65.8%, down from November's 66.9% and from 66.8% in December 2012. 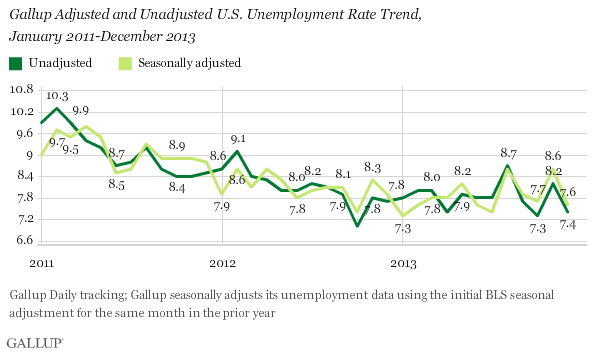 Without seasonal adjustment, Gallup's December unemployment rate was 7.4%. Gallup's seasonally adjusted U.S. unemployment rate for December, using an estimate of the government's likely adjustment factor, is 7.6%, down from 8.6% in November. Gallup calculates this rate by applying the adjustment factor the government used for the same month in the previous year, which in December 2012 was an increase of 0.2 percentage points. The exact adjustment the government uses for December 2013 will not be known until Friday's BLS release. The government's unemployment estimates are relatively stable from month to month; Gallup's measure of unemployment tends to exhibit more monthly fluctuation. Underemployment, as measured without seasonal adjustment, was 17.2% in December, little changed from 17.3% in November, and from 17.1% in December 2012. Gallup's U.S. underemployment rate combines the percentage of adults in the workforce who are unemployed (7.4% in December) with the percentage of those who are employed part time but looking for full-time work (9.8%). The overall percentage of the U.S. adult population that was employed full time for an employer dropped in December to 42.9%, a low a point since 2011. Further, the 34.2% of all Americans who were not in the workforce is up from what Gallup has measured over the past four years. At the same time, Gallup's seasonally adjusted U.S. unemployment rate -- the closest comparison it has to the official BLS numbers -- decreased in December. However, it is important to note that Gallup's adjusted number is based on past BLS seasonal adjustments, and those adjustments may not be the same this month. Additionally, while both Gallup and BLS data are based on robust surveys, the two have important methodological differences. Although Gallup's employment numbers highly correlate with BLS rates, Gallup's numbers tend to have more month-to-month variability, and the unemployment rate that BLS reports each month does not always track precisely with Gallup's estimate. Results for this Gallup poll are based on telephone interviews conducted Dec. 1-29, 2013, on the Gallup Daily tracking survey, with a random sample of 26,381 adults, aged 18 and older, living in all 50 U.S. states and the District of Columbia. Gallup's Economic Confidence Index improved to -19 in December from -25 in November, but is still below October 2012 through August 2013 levels. Economic confidence rose across income and partisan groups. Americans reported spending $96 per day in December. This is the highest monthly average since September 2008, and the highest spending for any December in six years. Gallup's Job Creation Index, which pushed past the +20 mark in recent months, ended the year at +19 in December, similar to the +20 in November. Still, that score is better than where the index stood in early 2013.